Who is Michelle Bell? | Michelle Bell; Your Central Iowa Violin Soloist For Any Occasion. 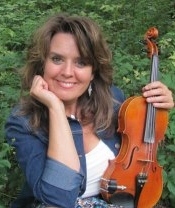 Michelle has shared her love of music with countless folks performing for various life celebrations and events, including playing violin in symphony orchestras, small ensembles,country and bluegrass bands, dances, and fiddle contests. She toured Europe with her symphony orchestra and competes in fiddle contests throughout Iowa, South Dakota, Minnesota, and Branson, Missouri. Michelle has had the great privilege to study violin with Alex DePue, a world-renowned violinist, fiddler, artist, and composer, with great appreciation. She and her piano partner Judy Watson, are a well known dynamic duo and perform together, regularly in the Des Moines area. Michelle’s family band,“Daniel and the Fiddle Chicks” consists of her son and daughters, (all of whom are accomplished musicians in their own right) and Michelle, as “The Fiddle Chic”. The group performs for weddings, dances, churches, community events, fundraisers, private parties, wineries, funerals, retirement homes, showers, and for fun. They all participate in fiddle contests, as well. Michelle also enjoys the teaching side of music and offers lessons to all ages in violin, piano and fiddle. Posted	on Monday, May 6th, 2013 at 2:58 pm	under Uncategorized.